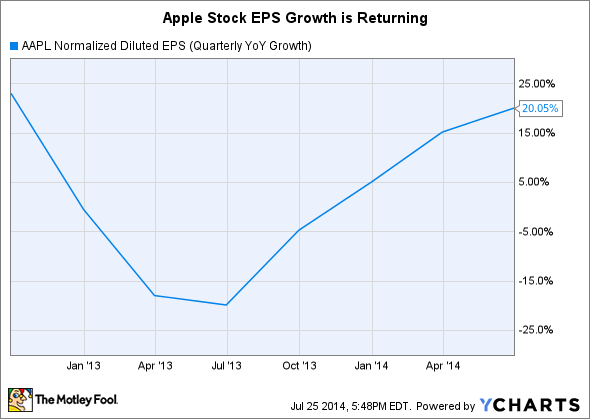 With Apple's third quarter now in the rearview mirror, it's time to look at the stock. What's driving it's massive gains, and is the stock still a buy? Helped by a solid third-quarter report, Apple (NASDAQ:AAPL) shares hit a new 52-week high this week of $97.88 -- only a few dollars shy of Apple's post-split all-time high of $100.72. That makes for a gain of about 55% in the past 12 months. There were two major factors that drove the stock higher this week. The main driver, of course, was Apple's earnings. Let's review the numbers. 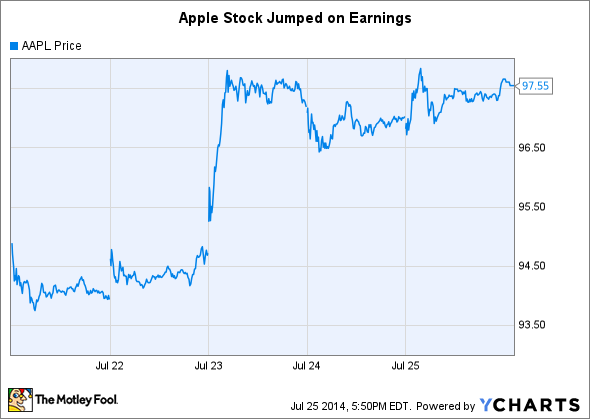 Apple posted solid results on Tuesday. While revenue came in slightly below estimates, and iPhone unit sales were in line with estimates, a better-than-expected gross profit margin of 39.4% versus Apple's guidance for a range of 37% to 38% helped Apple to still match earnings-per-share estimates in spite of the lower-than-expected sales. Apple's continued gross profit margin improvement, iPhone sales growth, and share repurchase program are helping alleviate concerns about Apple's bottom-line growth rates. Its reported 20% year-over-year growth rate for EPS shows the company hasn't peaked out its earnings potential -- a central conclusion behind the bear case in 2013. While shares initially traded slightly lower in after-market hours when Apple's third-quarter report was released, the market turned positive by market opening the next day, sending the shares up about 3%. 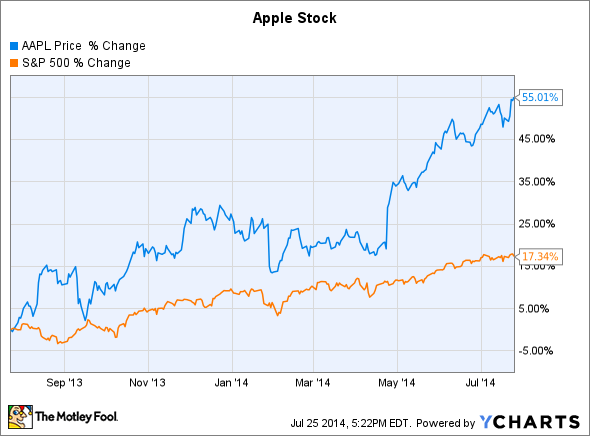 Consider ISI analyst Brian Marshal (via Fortune), who is bullish on Apple thanks to the iPhone 6. He thinks the next-generation iPhone line is likely to be a huge driver for Apple's business. We know of few technology companies that can afford to be ~2 years behind the market on key trends (e.g., move to large ~5" display iPhones) and still be relevant in the market, especially when it comes to consumer electronics. In our view, it's hard to overstate the value of AAPL's ecosystem assets (e.g., iTunes, iCloud, App Store, etc.). ... Importantly, we believe the power of these assets is about to be unlocked when AAPL releases a large-display iPhone later this quarter. In our view, this is likely to both entice Android users back to the iPhone and drive massive upgrades in the installed base. iPhone 6 concept. Design by Tomas Moyano and Nicolas Aichino. Then there's the rumored iWatch, of course, which also is speculated to launch this fall. Apple's huge 36% sequential increase in total off-balance sheet commitments to third-party suppliers, component orders, manufacturing tooling, research and development, advertising, and Internet and telecommunications equipment revealed in the Q3 10-Q filing support this notion that Apple has big plans for its new products this fall. And a report from The Wall Street Journal this week, asserting that Apple has put in orders to partner suppliers in Asia of an unprecedented 70 million to 80 million iPhone 6 devices, also suggests Apple is ambitious about its fall launch. Given Apple's conservative valuation in light of its big product plans, Apple stock offers enticing value at levels around $100 for investors with a long-term time horizon.